Those who read the self-history of Islamic State West Africa Province (ISWAP) and its critique of Abu Bakr Shekau will note that the text mentions more than once a certain Abu Malek al-Tamimi. He is referred to as "our sheikh" by the authors and is cited as a particular source of inspiration in the preamble to the refutation of Shekau's ideas of 'chain takfir.' 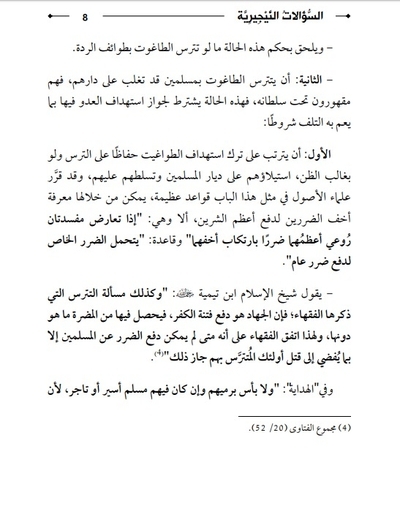 Further, Abu Malek al-Tamimi is cited in the book's footnotes in relation to a work called 'Nigerian Questions', in which he advised ISWAP that it is in fact correct to say that the Earth is spherical (despite what 'Boko Haram' founder Muhammad Yusuf believed and what Abu Bakr Shekau asserts) and that it is generally not in the interest of the jihad at this stage to target schools teaching doctrines of kufr. In this post I present the text of 'Nigerian Questions' in full with translation. For some context, Abu Malek al-Tamimi's real name was Anas al-Nishwan. Originally from Saudi Arabia, he reputedly graduated first from the Imam al-Da'wa al-Ilmi institute and then studied in the Shari'a department of Imam Muhammad bin Sa'oud Islamic University in Riyadh. He then studied for a master's in the higher institute for judiciary on the issue of al-Fiqh al-Maqarin (where one compares differing opinions of jurists on certain issues and then tries to deduce what is most probably correct). However, he did not complete his studies, instead going to Afghanistan in 2010 to join al-Qa'ida. He then subsequently went to Syria in 2014 and joined the Islamic State. He was killed while participating in the capture of al-Sukhna in the Homs desert from the Syrian government in May 2015. Abu Malek al-Tamimi appeared in an al-Furqan Media video that was released in April 2015 and became infamous for showing the brutal execution of Ethiopian Christians by the Islamic State in Libya. In his brief appearance in the long video that attacks Christianity, he emphasizes that the Islamic State deals with "the disbelievers from the people of the Book" [Jews and Christians] on the basis of the Book [Qur'an] and Sunna. 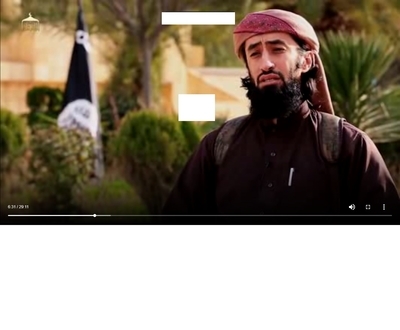 Abu Malek al-Tamimi's appearance in the April 2015 al-Furqan Media video. 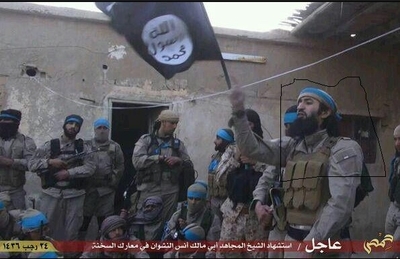 Abu Malek al-Tamimi in military attire, highlighted with the square around him. The work 'Nigerian Questions' was originally written in March 2015 by Abu Malek al-Tamimi in response to queries from ISWAP. 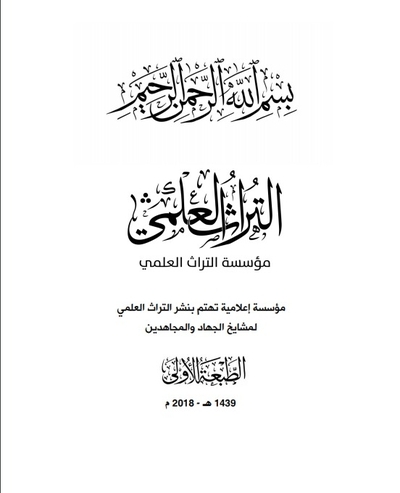 It was published for a wider readership this year by the outlet Mu'assasat al-Turath al-'Ilmi ('Ilm Heritage Foundation), which, interestingly, is one of the most disliked pro-Islamic State outlets among supporters of the group's official media output. Such supporters deride al-Turath al-'Ilmi and others as mashbuhun ("suspect"). 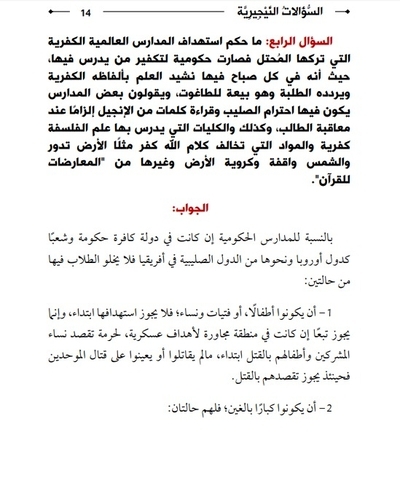 In al-Turath al-'Ilmi's case, not only is the foundation releasing a substantial amount of material without Islamic State official authorization, but it is also broadcasting claims of internal strife in the Islamic State, including reports of arrests of scholars like Abu Yaqub al-Maqdisi (about whom more in a subsequent post). A June 2018 post on an pro-Islamic State Telegram forum listing dozens of "suspect" outlets and individuals, including Mu'assasat al-Turath al-'Ilmi. 1. A person does not become a disbeliever merely by residing in the abode of kufr [disbelief]. 2. It can be permissible to target Taghut [idolatrous tyrant] targets in areas where they are trying to shield themselves from the mujahideen's attack by being based among merchants and civilian residents. Under certain conditions, the mujahideen can still attack them if those 'human shields' are fellow Muslims and it is thought that some of those Muslims might come to harm. 3. Bearing ID documents of a kufr government does not automatically make someone a disbeliever. There are different scenarios and each scenario has its own ruling. 4. It is generally not in the interest of the jihad at this stage to target schools in which kufr ideas and doctrines are taught, unless e.g. those schools are adjacent to military targets that are essentially using those schools as civilian shield cover. As a side note, the Earth is spherical and the person who asserts that is not a disbeliever for asserting it. Issues 1, 2 and 4 are also explored in ISWAP's book, which quotes from 'Nigerian Questions'. 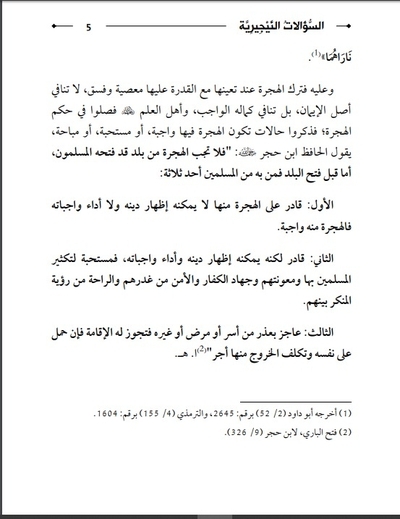 The excerpts in the ISWAP book confirm the authenticity of Mu'assasat al-Turath al-'Ilmi's printing of the work. 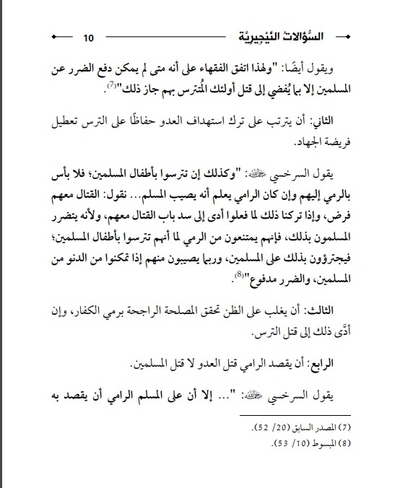 Below is the text in translation, including an introduction by Mu'assasat al-Turath al-'Ilmi. His Eminence the Mujahid Sheikh Abu Malek al-Tamimi (may God accept him) responded to them. 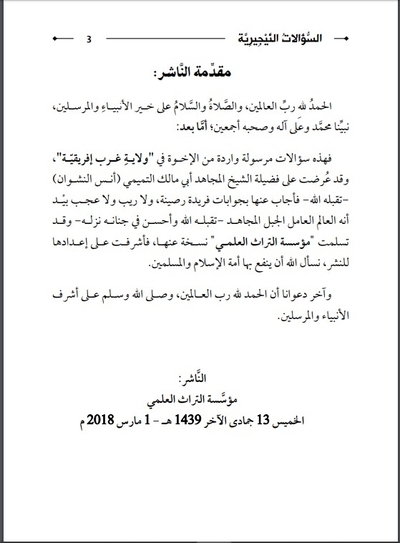 Mu'assasat al-Turath al-'Ilmi: a media foundation concerned with publishing the literary heritage of the mashayakh of jihad and the mujahideen. First printing: 1439 AH/2018 CE. 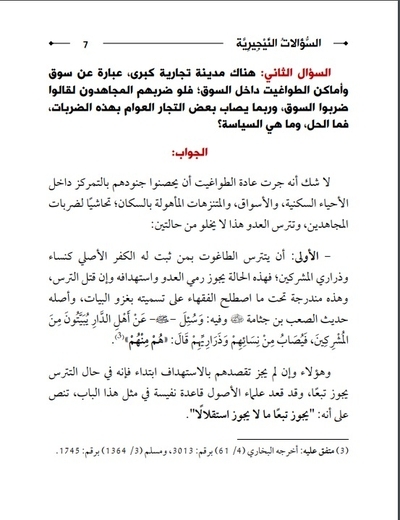 These are questions that were sent by the brothers in 'West Africa province' and shown to his Eminence the Mujahid Sheikh Abu Malek al-Tamimi (Anas al-Nashwan)- may God accept him- so he responded to them with individual, firm answers, with no doubt or surprise as he was the knowledgeable, working, mighty mujahid (may God accept him and place him in the highest abode of His paradise). 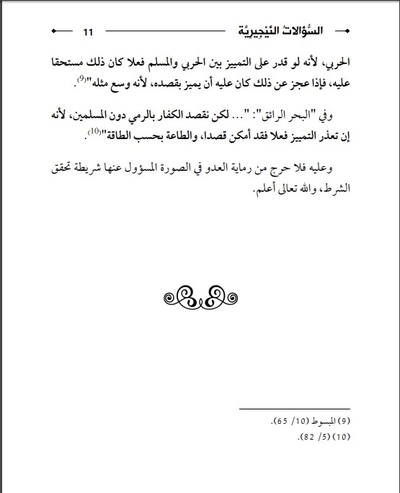 And Mu'assasat al-Turath al-'Ilmi obtained a copy of them and supervised their preparation for publication. We ask God that He should benefit through them the Ummah of Islam and the Muslims. And the last of our calls is that praise should be to God the Lord of the Worlds, and God's blessings and peace be upon the noblest of the Prophets and those sent. Thursday 13 Jumada al-Akhir 1439 AH: 1 March 2018 CE. Does the Muslim become a disbeliever merely by living in the abode of kufr? What is apparent- and God Almighty knows best- is that merely residing in the abode of kufr is not by itself kufr. Rather it will only be if there comes together in it the prerequisite of kufr from agreement with it or loyalty to its people. That is attested in the fact that the texts of the Book and Sunna did not deny the Islam of the one who resided among the backs of the mushrikeen merely for residing, but rather they established it for him. The Almighty says: "And those who have believed and not migrated: you have nothing from guardianship of them until they migrate" (Surat al-Anfal 72). And the Almighty says: "And were it not for believing men and women you did not know that you might trample them and there should befall on you from them a dishonor without your knowledge; that God should bring into His mercy whoso He wills. Had they been apart from them, We would have punished those who have disbelieved with a painful punishment" (Surat al-Fatah 25). 1. Capable of migrating from it, unable for him to show his religion or undertake its obligations. Hijra from it is obligatory. 2. Capable but can show his religion and undertake its obligations, so hijra is desired to increase the Muslims through it, aid them, wage jihad against the disbelievers, keep safe from their treachery and have repose from seeing the condemned act among them. As for what is transmitted from some of the 'ulama (like Ibn Hazim and others) about applying takfir to the one who abandons hijra or joins the abode of kufr, it is based on the idea of the one who does that out of loyalty to the disbelievers or out of affection for them, and God Almighty knows best. There is a very large commercial town, with a market and the places of the Tawagheet are inside the market. If the mujahideen were to strike them they would say they hit the market, and perhaps some of the merchants of the general populace would be wounded in these strikes. So what is the solution, and what is the policy? And these people, even if it is not allowed to target them intentionally in principle, it is thus allowed in the event of shielding as a consequence, and the 'ulama of the principles put in place an important basis on the likes of this matter, affirmed as follows: "What is not allowed by itself independently is allowed as a consequence." - Appended to the ruling of this case is if the Taghut is shielded with the sects of apostasy. a) Not targeting the Tawagheet out of a desire to protect the shielding leads- even in probability of thought- to their seizure of the abode of the Muslims and their gaining authority over them. And the 'ulama of principles have established serious foundations in the likes of this case, through which it is possible to know the lesser of two harms to repel the greater of two evils. One of them is: "If two evils conflict with each other, the more harmful of them is taken into account by committing the lesser of them." And another foundation: "The particular harm is borne to repel a general harm." And if the Tawagheet know that the mujahideen will refrain from targeting them if they shield themselves with the Muslims, that means they cannot be fought, as they fortify themselves in the residential areas and markets of the Muslims populated by them. And the harm of this without doubt is great and its evil openly clear, leading to the disappearance of the religion and its people, and therefore the jurists (may God be pleased with them) agreed that it is allowed to strike the enemy shielded with the Muslims, even if that leads to the killing of the shielding, particularly if the harm in abandoning it is dreaded. b) Not targeting the enemy out of a desire to protect the shielding leads to impeding the obligation of jihad. c) It is deemed most likely that the greater interest can be realized by striking the disbelievers, even if that leads to the killing of the shielding. d) That the one who strikes intends to kill the enemy, not the Muslims. Therefore there is no objection in striking the enemy in the scenario asked about so long as the conditions are fulfilled, and God Almighty knows best. 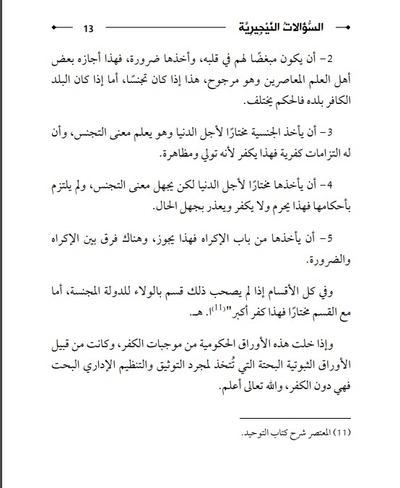 The issue of takfir of the one who bears ID documents like nationality and passport, except one compelled like the mujahideen who want to go out to jihad, and the basis of takfir in them is that they constitute contentment with the land that is ruled by kufr and bears documents on which are the symbols of states of Taghut. What is apparent is that the aforementioned basis for the kufr of the one who bears the ID cards is takfir by assumption and it is not controlled, because many of those who bear these documents do not recognize the land that issued them: in fact they disavow it and disavow its symbols. But rather the dependent basis is in what the state that grants these documents imposes on those who demand them, for if it imposes on them as a condition what necessitates kufr, like embracing loyalty to and supporting the state that grants them, and coming under its rule. That is kufr, and help is to be sought in God. And his eminence Sheikh Ali al-Khudayr- may God free him- was asked: what is the ruling on adopting the nationality of the disbelievers? 1. Taking the nationality out of affection for them and their religion or supporting them and loyalty to them: this is greater kufr. 2. He hates them in his heart, and takes it for necessity, this is permitted by some of the contemporary Ahl al-'Ilm and it is the more probably correct opinion. This is if it is naturalization. As for if the land of kufr is his land, the ruling differs. 3. He takes the nationality by choice for the purpose of this material world and he knows the meaning of naturalization, and that it has obligations of kufr. This constitutes kufr because it is loyalty and support. 4. He takes it by choice for the purpose of this material world but he is ignorant of the meaning of naturalization, and has not complied with its rulings. This is forbidden, but does not result in kufr, and the person is to be excused for ignorance of the situation. 5. He takes it by compulsion. This is permitted, and there is a difference between compulsion and necessity. And if these government documents are devoid of the obligations of kufr, and they are such as merely ID documents that are taken just for purposes of documentation and administration organization, they are beneath kufr, and God Almighty knows best. 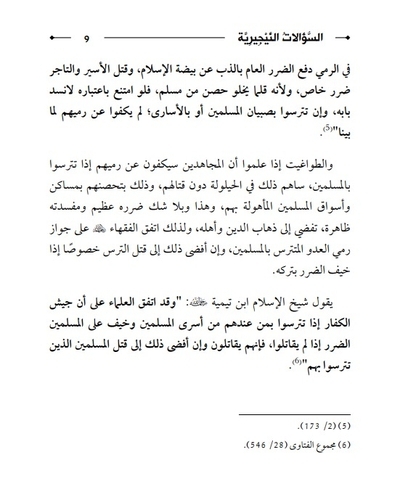 The question of what the ruling is on targeting the global schools of kufr that the occupier left behind so they became government institutions, on account of takfir of the one who studies in them, as every morning in them is sung the national anthem with expressions of kufr and the students repeat them and it is allegiance to Taghut. And they say some of the schools have in them respect for the cross and recital of words from the Gospel as obligation on punishing the student. and likewise also the colleges in which are taught kufr science of philosophy and the subjects that contravene God's word as kufr like the notion that the Earth orbits and the Sun is stationery and the spherical nature of the Earth and other things that are in "opposition to the Qur'an." 1. They are children, girls or women. It is not allowed to target them in principle, but it is allowed by consequence if they are in an area next to military targets, as it is forbidden to target the women of the mushrikeen and their children for killing in principle, so long as they have not fought or helped to fight the monotheists. In such a case it is permitted to target them for killing. a) Students who are original disbelievers. So the principle is that it is permitted to target them and kill them, but there is to be observed in the issue of fighting them the matter of interests and evil corruptions that the people of the matter are to assess. For if the matter is such that they did not fight us first, they are to be left alone, because devoting oneself to fighting those who have fought us is more important and has greater priority. b) The students are of the sons of the Muslims on whom kufr has come after they joined these schools. These people: either they are of age, so their apostasy from them is correctly judged, or they are distinguished beneath the age of people, and so the 'ulama have disagreed on the soundness of their apostasy. The point is that it is not in the interest to target these schools in this stage unless the enemy is shielded with them, and if we cannot reach him except by targeting them, and God Almighty knows best. As for the issue of the spherical nature of the Earth and its rotation [/revolution]. Believing in such things is not from clear kufr on account of which the blood of the one who believes such things becomes permissible. For your information, the general mass of the Ahl al-'Ilm asserted that the Earth is spherical, and only the minority denied it. And the Sheikh of Islam Ibn Taymiyya and others besides him asserted it, and it is the correct view. So the one who believes that is not to condemned, let lone have takfir declared on him and his blood made permissible to be shed. And God Almighty knows best. 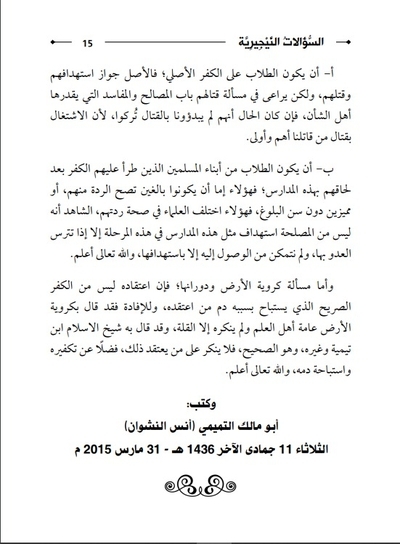 Tuesday Jumada al-Akhir 1436 AH- corresponding to 31 March 2015 CE.